We at the Rapidseedbox value our clients above anything else. Because of that, we are in the constant search for ways to implement new stuff so our clients can have the best service possible. Due to high demand, we implemented One-click Installers that helps you quickly install over 50 applications on your machine with minimum effort. One-click Installers are executable scripts that when initiated auto install and configure desired software onto clients seedboxes without any previous requirements and inquiries from the client’s side. 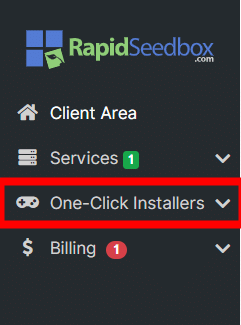 To be blunt, whichever software you want from One-click Installers list to be installed on your seedbox, all you have to do is click on it and wait for it to be installed. If you have a Seedbox prior to November 1st, 2016 you will be required to upgrade your Seedbox free of charge. Please contact us using the chat widget below for an upgrade. How to access One-click Installers page? First, you need to access your Client Area. You can access your Client Area by navigating to the link found in your Welcome email. 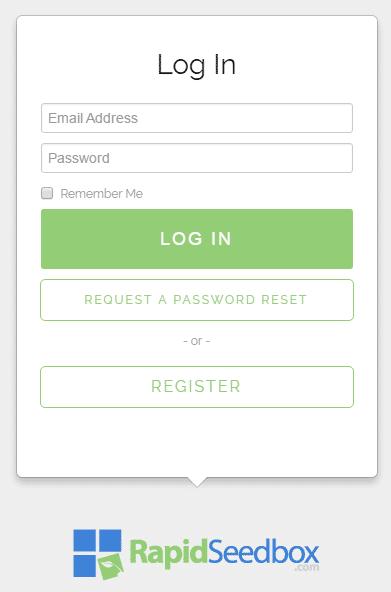 A login window will be displayed (see picture below). Enter your credentials, and press LOG IN. Note: If you enter wrong credentials for more than three times, our System will blacklist your IP. This happens due to the prevention of Brute-force attacks. Our system removes your IP from the blacklist in 15 minutes from the last attempt so please be patient. Otherwise, reboot your router to have a new IP address allocated. After you log in to your Client Area on your left side you will see a Menu links with different groups for your service. Among these links, you will see one that is named “One-click Installers” ( see picture below ). Just click on it and it will show you the list of all yours Seedboxes. Look on the side menu, under One-Click Installer, navigation link that includes your seedbox plan name and your seedbox IP, for the example: Quick (111.111.111.111) – default or custom name for your seedbox. This way you can navigate between all your seedboxes ( if you have more than one ) and install and uninstall software on seedbox that you chose. If you have more than one seedbox all your other seedboxes will be represented as menu links like one on the picture above. In order to access them, you just need to click on them. As soon as you choose Seedbox from One-click Installers menu group, you will see the notification about the Seedbox Maintenance installation (see image below). As you can see the first time when you use One-click Installers you should install Maintenance installer ( Only first time ). This is due to operating system updates are required in order to provide the best possible foundation for all future installations, and in that way prevent glitches and bugs to be created. Also, this update will freshen up your operating system and update all the software to it’s latest available versions. You can always Sync your Seedbox, by clicking on the reload icon on the right corner of the installers table (see image below). This will Sync your installers with web application, so you will be up-to-date online. When you first enter One-click Installers page you will only have “Not installed” list. In it, you can find all installers that are available for you to install on your seedbox. As soon as you install any of available installers they will be transferred to your Installed list. By doing that you always can know which installers are on your seedbox and which ones are available for you to install. How to use One-click Installers? In order to install wanted installer, navigate to a row of that installer that is “Available”, and click on wrench icon ( see image below ). After that small info window will appear in the right top corner and it will look like in picture below. After that Installer will go from “Available” to “Installed”. From where you will be able to uninstall it by pressing trashcan icon or see credentials of the wanted installer (if it has them ) by pressing the key icon.